Is an upgrade to Windows 10 really worth it? Microsoft’s Windows 10 desktop operating system has to overcome the user interface problems of its predecessor, Windows 8. It must also convince consumers and IT leaders that the time and work involved in moving from older versions –whether that’s Windows XP, Windows 7 or Windows 8—to something new is worth it. The return of the Start menu, the addition of the Action Center, and improved navigation, security and Command Prompt tools all aim to sway admins and users toward Windows 10. A seamless user experience among device types doesn’t hurt the operating system’s appeal either. 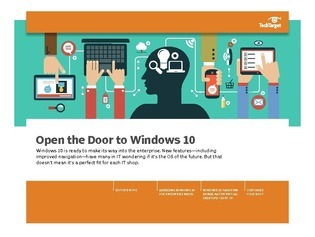 But IT managers and decision makers face an important task in determining whether the features Windows 10 has to offer are right for their organizations. Shops have to ask themselves: Is the timing is right for an upgrade? And how will it benefit their staff? Find out in the following exclusive article from our experts at searchEnterpriseDesktop.com.